To get the wallpapers installed on your iPhone or iPod Touch is pretty easy if you have the latest firmware 2.0 – just visit the Wallpaper section in the on your iPhone, press and hold the wallpaper you link and wait for the “Save Image” button to appear. 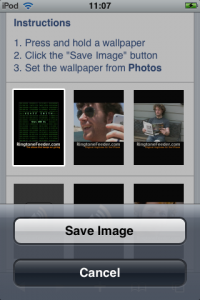 Once you have saved the wallpaper it will be available in the Photos application on your iPhone and from there you can simply activate the wallpaper. If you are on a previous firmware version there are several ways you can get the wallpapers onto your phone including a photo feed. Please check our iPhone wallpapers step-by-step guide if you have any problems getting it to work. This entry was posted on Sunday, July 20th, 2008 at 1:50	by Administrator and is filed under News. You can follow any responses to this entry through the RSS 2.0 feed.